The prophet here can be identified by the name 'HELPAS'. We know he must be a prophet because of the way he is depicted and his association with a Tree of Jesse. However, no prophet by the nane of 'Helpas' is known to have existed and it is possible that there has been some alteration to the scroll. 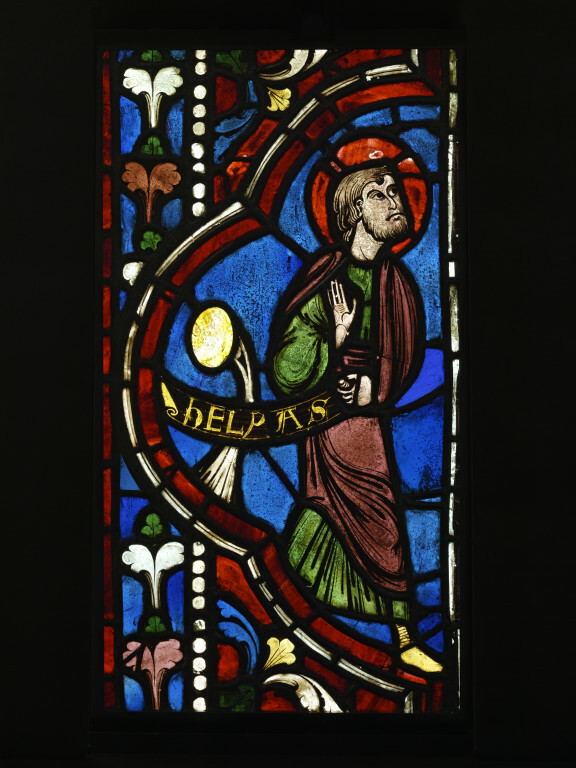 Jesse Trees with their kings and prophets were produced in all forms of church art from the 11th century and throughout the medieval period. There was no standard convention for the depiction of the prophets and the kings. The style of painting on this figure is the same as on those in panels 5D-E and 6 to 6A-1881. The facial features are full and rounded. The eyebrows are heavy and the eyes and pupils of the eyes are large. The clothing follows the form of the body. The figures' hair is straight and not curled. These figures are identified by their inscribed scrolls, have a large stemmed flower within the demi-quatrefoil they stand in and there are no small sections of ground between their feet. All of these feaures distinguish this group of prophets from the other group (5 to 5C-1881). Most of the prophet figures in this collection are paired, are mirror images of each other, indicating that each pair was made from the same cartoon or design drawing. The whole figure in this panel is the reverse of that in no. 6A-1881 indicating that they were made from the same cartoon or design drawing. HELPAS bordered top and bottom. The inscription denotes the name of the prophet HELPAS. 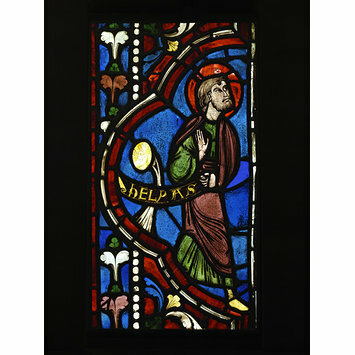 This panel depicts the Old Testament prophet Helpas and is identified by the scroll he holds in his hands.